At Lost Creek Mushroom Farm, shiitake mushrooms grow naturally on hardwood logs, hibernating in summer and winter. With the cooling autumn temps and the first fall rains, the logs are bursting with prime shiitakes; and this is the optimal time for mushroom lovers and gardeners to start growing their own shiitake logs, harvesting every 2 months or every month with the popular Ma & Pa Shiitake Mushroom Log Kit. Shiitakes are all about health and well being. They have high energy. They taste good. Log-grown shiitakes have it all. That's why we love growing them, making the logs and sharing them with our customers. The equinox, cooling temperatures, rain -- These are the conditions that signal mushrooms to grow in the yard and in the woods. 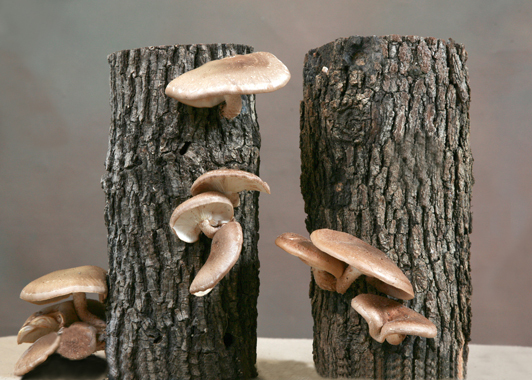 This is the optimal season for growing shiitake mushrooms at home on hardwood logs such as oak, gum, hickory, or cherry. 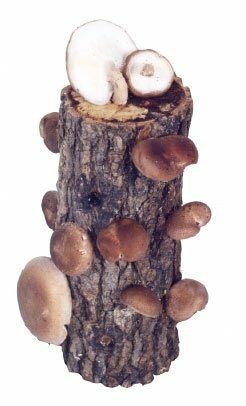 In the den or livingroom, on the porch, or under a shade tree in the yard, temperatures in the 70s-80s are perfect for inviting beautiful brown shiitakes to burst through the bark of a shiitake mushroom log kit. Shiitake farmers Doug and Dr. Sandra Williams of Lost Creek Mushroom Farm sell grow-your-own shiitake log kits, injected with spawn (mushroom seed material) and nurtured for almost a year until they're ready to 'fruit.' Then they produce the world' second-most popular mushroom every two months for years, with increasingly larger yields as the log matures. The kits arrive ready for the 'shock' of an ice water soak that will trigger the fruiting, blooming, and harvest -- in 6-10 days. Sandra added, "Fall and spring are the optimal seasons -- the biggest crop, the biggest mushrooms, and the most delicious mushrooms of the year grow in September and October, March and April -- in Nature, and on cultivated logs." Shiitakes are high in protein and low in fat. They stimulate the immune system and are used nutritionally to fight viruses, high cholesterol, chronic fatigue syndrome, and more. In Japan concentrated shiitake and reishi mushroom compounds are used to treat cancer and AIDS. Sandra and Doug have just returned from Beijing, China, where they attended the 7th International Medicinal Mushroom Conference. Sandra reported, "A great deal of research is going on around the world, and especially in Asia, on shiitakes and other mushrooms used to treat disease, especially cancer, and to promote health and well-being. "We post "Fungi Factoids" on our Lost Creek Mushroom Farm Facebook page, with information on the amazing benefits of different mushrooms, including their effects on diabetes, aging, on dementia and Alzheimer's, inflammation and oxidative stress-- important for athletes, counteracting the damaging effects of radiation therapy, and more. We urge people to like us on Facebook and get this information in their news feeds." Lost Creek Mushroom Farm donates a portion of sales to Mushrooms in Ghana Project, the Williams’ effort to help expand production for West African mushroom farmers, most of them women. Each log kit sale helps farmers lift themselves out of poverty. The log kits come in a range of prices, which include shipping and handling. The 6” ‘Shroomie sells for $18 and the popular 10” single log is $29.95. 'A great savings, Sandra said, 'is the Ma & Pa Kit, at $49.95. It comes with two 9-10” logs, so you can harvest every month by alternating the producing log. 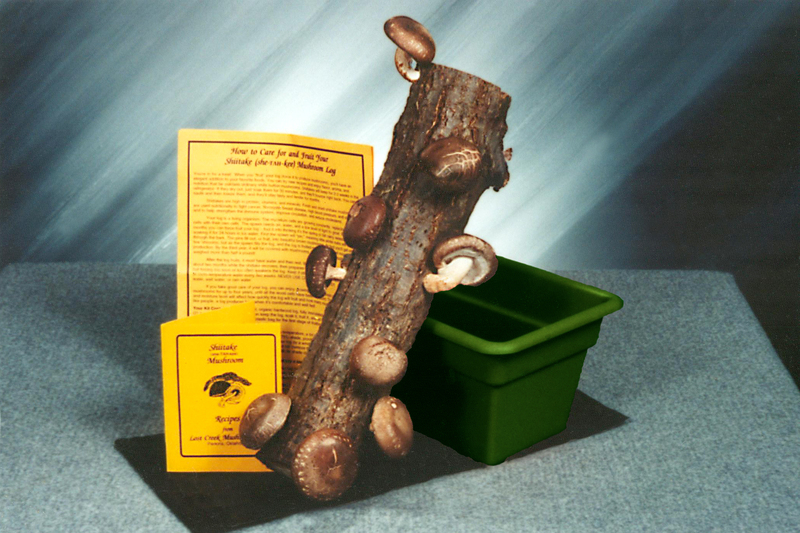 The Original Tray Kit, a 14" log with it's own tray for soaking, fruiting, and storing the log, sells for $54.95. Lost Creek offer the tray kits as a Best Buy, two for $95 shipped to the same address. Each kit comes with full instructions, quick-start instructions, and recipes. All kits 9-10" and larger are guaranteed to produce. The Shiitake Sampler Cookbook by Janet Bratkovich, with 51 kitchen-tested shiitake recipes, is available for $7.99 when shipped with a log kit, or $9.99 when shipped separately. More shiitake products are available, including the “Shiitake Happens” bumper sticker. For a free brochure or to order by phone, call 1-800-792-0053. 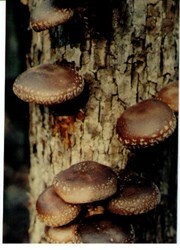 Order online at http://www.shiitakemushroomlog.com or by mail to Lost Creek Mushroom Farm, PO Box 520, Perkins, OK 74059. Lost Creek Mushroom Farm kits are available on Amazon.com at slightly higher prices.